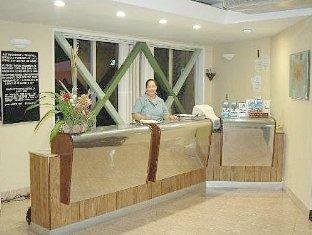 ﻿ Best Price on Hotel Estrella in Managua + Reviews! Offering free breakfast, an extensive garden and a swimming pool, Hotel Estrella is located 0.6 mi from Las Americas Shopping Mall and 2.5 mi from the Handicraft Market. Free Wi-Fi is available. The air-conditioned rooms feature a wardrobe, flat-screen cable TV and tiled floors. The decoration is contemporary and the bathrooms come with shower, free toiletries and hairdryer. The on-site restaurant offers local food, and guests can find other options such as bars and restaurants serving regional food and international dishes within 1.2 mi. A gym, banquet facilities and airport shuttle are other features at this property. Hotel Estrella is 4.7 mi from Santiago de Managua Cathedral and the National Palace of Culture. Managua International Airport is 15-minute drive away.